Here are some images of Australian currency. Click on the small images for a large version (each approximately 40-60 kilobytes). Some of the notes below are printed on paper, others are printed on a thin, flexible polymer (i.e. plastic). The polymer notes are fairly new - The Australian Mint is currently in the process of replacing all paper money with polymer. This change has also allowed the Mint to redesign the artwork on the notes. The last major change occurred in 1966, when Australia converted from pounds, shillings and pence to decimal currency (dollars and cents). It is the Mint's stated intention to redesign and re-issue the Australian banknotes every 25-30 years in order to make use of the most up-to-date anti-forgery technology and to allow the depiction of further prominent Australians on the currency. This note is printed on polymer. It was issued as a replacement for the paper $5 note in 1990(?). The brightest white area surrounding the gumflower motif is actually transparent. There are two different versions of this note. The older one was discontinued and replaced with the newer one in April 1995. 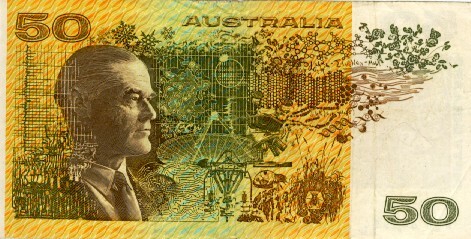 The font of the denomination number was changed to match the $10 and $20 polymer notes, and the colouring was changed to make it more easily distinguishable from the $10 polymer note. Other features remained the same. The front design features a portrait of Queen Elizabeth II of England, who is Australia's Head of State. A gum tree (eucalyptus) branch in flower appears on the left. The reverse design features a schematic drawing of Australia's Parliament House, in Canberra. The building nestles inside a natural hill - a grassed slope covers most of it. The flagpole is the tallest permanent flagpole in the world. This note is printed on paper. It was replaced by a polymer note in 1993, and is no longer being printed. It is has been mostly removed from circulation by the Mint. 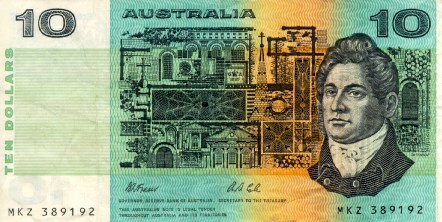 The front design features a portrait of Francis Greenway, who was transported to Australia as a convict in the 18th century. When the new colony required the services of an architect, it was discovered that Greenway was an architect. He designed many of Sydney's early buildings, several of which still stand today, and was fully pardoned for his service to the community. 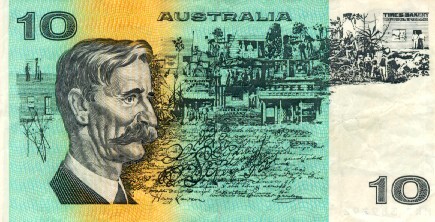 The reverse design features a portrait of the poet and author Henry Lawson. The town in the background is Gulgong, in New South Wales, where Lawson grew up. Lawson wrote many famous poems, including The Man From Ironbark and the popular children's poem Mulga Bill's Bicycle, as well as such short stories as The Loaded Dog. This note is printed on polymer. It was issued as a replacement for the paper $10 note in 1993. The brightest white area surrounding the windmill motif is actually transparent. Unfortunately, the $10 note scanned here was damaged, with a piece torn away from the top edge. The front design features a portrait of the poet A. B. ``Banjo'' Paterson, most famous for writing the words of Waltzing Matilda. Paterson also wrote the famous poem The Man From Snowy River. The rectangular border framing Paterson's face is comprised of micro-printing of the first verse from the poem. The reverse design features a portrait of Mary Gilmore, a poet and social activist. The rectangular border framing Gilmore's face is made of micro-printing of her most famous poem, No Foe Shall Gather Our Harvest, written and published during the darkest years of World War II as an inspiration for the people of Australia. This note is printed on paper. It was replaced by a polymer note in 1995, and is no longer being printed. It is slowly being removed from circulation by the Mint. The front features a portrait of Sir Charles Kingsford-Smith, a pioneering aviator. He made the first solo flight from Europe to Australia, in his aeroplane The Southern Cross. Sydney's international airport is named after him. The reverse features a portrait of Lawrence Hargrave, a scientist whose experiments with box kites helped pave the way for the first powered flights and led to the development of aeronautical science and engineering. This note is printed on polymer. It was issued as a replacement for the paper $20 note in 1995. The brightest white area surrounding the compass-points motif is actually transparent. The front features a portrait of Mary Reibey, a pioneer who started and ran a successful shipping business in Sydney in the early 1800s. 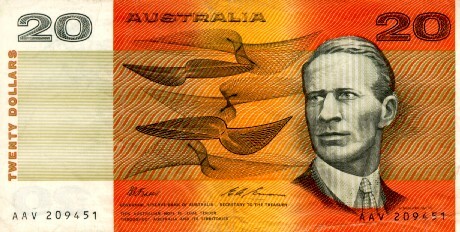 The reverse features a portrait of John Flynn, who began the Royal Flying Doctor Service. The RFDS is a vital service for the many Australians who live in remote areas, far from medical care. Emergency calls can be made on shortwave radio, and the nearest doctor will be flown in within hours. This note is printed on paper. It was replaced by a polymer note in October 1995, and is no longer being printed. It is slowly being removed from circulation by the Mint. The front features a portrait of Howard Florey, co-discoverer of penicillin and driving force behind the research which led to its introduction to medicine. 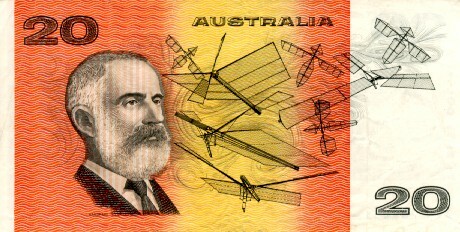 The reverse features a portrait of Sir Ian Clunies-Ross, first chief of the Commonwealth Scientific and Industrial Research Organisation (CSIRO). The CSIRO is an arm of the Australian Government, and carries out world-class research in many fields, with agriculture and astronomy prominent. This note is printed on polymer. It was issued as a replacement for the paper $20 note in October 1995. The brightest white area surrounding the Southern Cross motif is actually transparent. The front features a portrait of David Unaipon, an inventor and Australia's first published Aboriginal author. Unaipon was born in 1872 at Point McLeay Mission on the lower Murray in South Australia. In 1909 he patented an improved handpiece for sheep shearing. He also invented a centrifugal motor and a multi-radial wheel, gaining him a reputation as ``Australia's Leonardo''. Awarded the Coronation Medal in 1953, Unaipon died at the age of 95 in 1967. 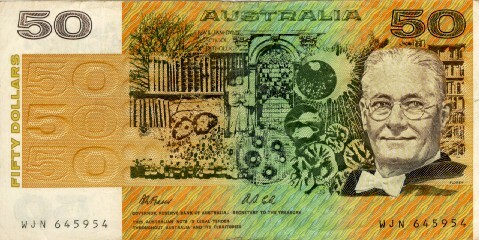 The reverse features a portrait of Edith Cowan, Australia's first female Member of Parliament. Cowan was elected to the Western Australian Parliament in 1921, one year after legislation preventing women entering politics was repealed. This note is printed on paper, and is due to be replaced by a newly designed polymer note in 1996. The front features a portrait of Douglas Mawson, an explorer who led several expeditions to Antarctica. The reverse features a portrait of Sir John Tebbutt, an astronomer.